Traveleyes welcomes you to explore the unique world of Uzbekistan, the central Asian nation of varied and fascinating culture. 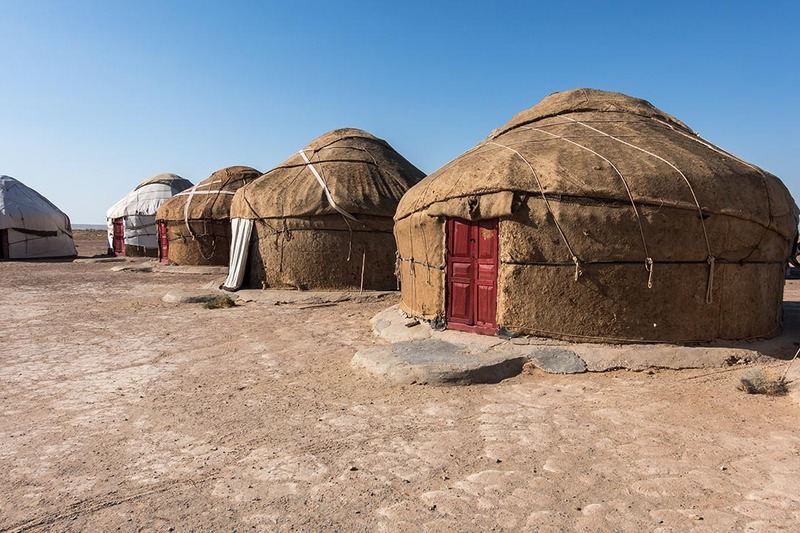 The Uzbeks are a Turkic people who traditionally lived in yurts and they traversed the famed Silk Road which once connected the trade routes of the East and West and runs through the heart of Uzbekistan. 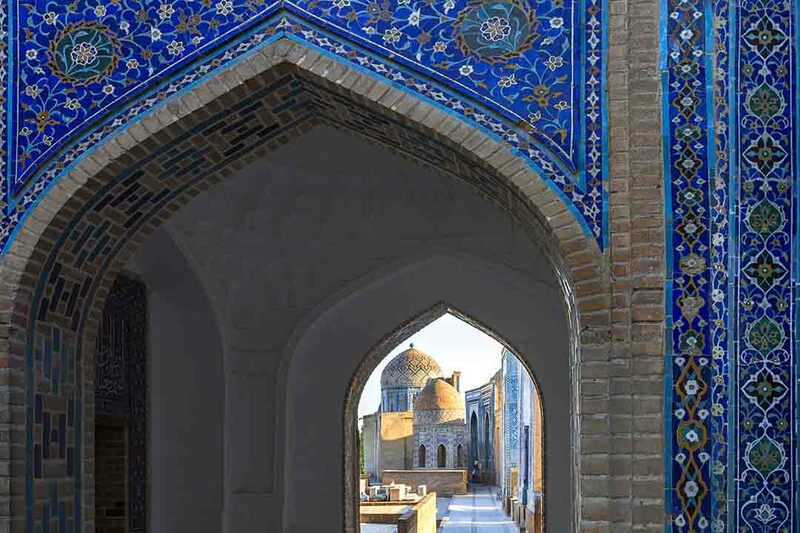 This tour of discovery will illuminate an enigmatic land, explore cities conquered by Alexander the Great, and survey the grandeur of immense mosques, minarets and mausoleums juxtaposed with the iconic architectural legacy of the Soviet era. We will be welcomed by a warm culture as we discover the walled city of Khiva, spiritual Bukhara and spectacular Samarkand. 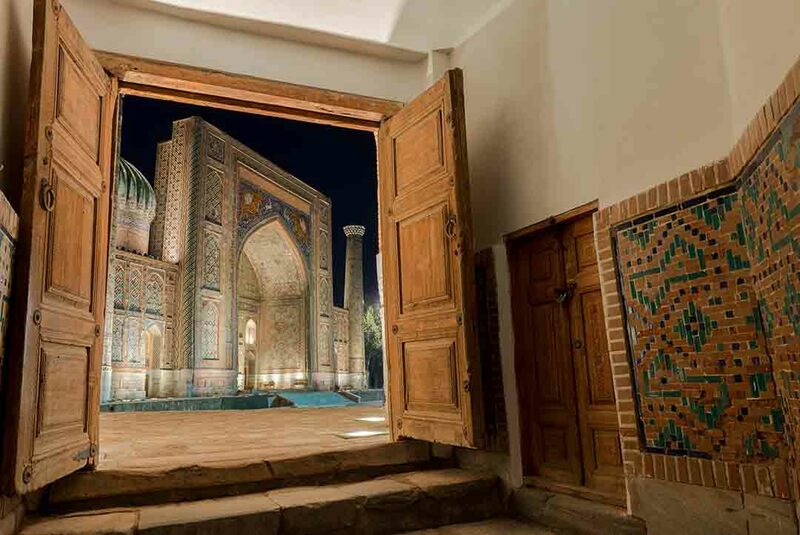 Uzbekistan is waiting to tell you its spellbinding story. Today we leave the UK and begin our journey to Tashkent, Uzbekistan. After landing in Tashkent, we’ll transfer to our hotel for breakfast before beginning sightseeing in Tashkent. We’ll see Independence Square – named in 1991 when Uzbekistan declared independence from the Soviet Union – and Earthquake Monument, as well as visiting Amir Temur Square and the Applied Arts Museum. In the afternoon, we’ll check into the hotel and then enjoy some free time in the evening. Breakfast included. Overnight in Tashkent. It’s an early start this morning as we fly from Tashkent to Urgench at 7am before transferring to Khiva. 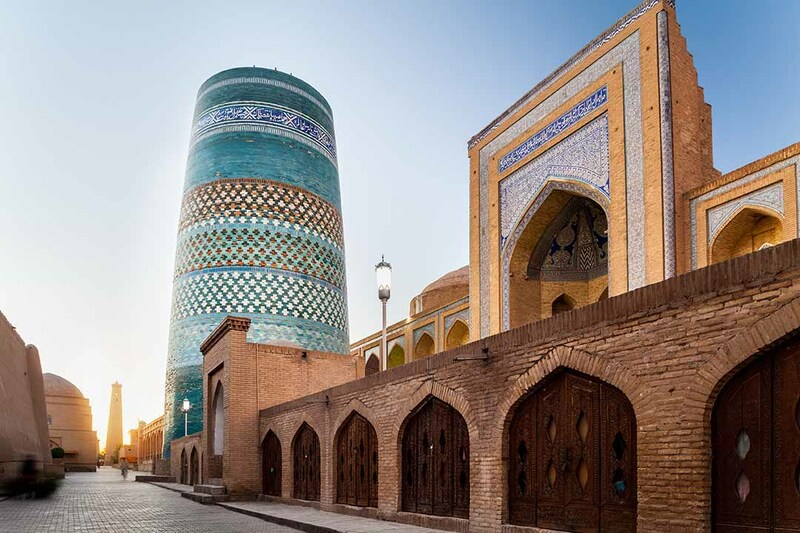 Upon arrival in Khiva, we’ll visit the UNESCO World Heritage site of the walled city, Ichan-Qala. In this fortress, we’ll visit Kunya-Arc, Sayeed Alauddin Mausoleum, Toshkhovli Palace, Pakhlavan Makhmud Mausoleum and the Minaret Islom Khodja. 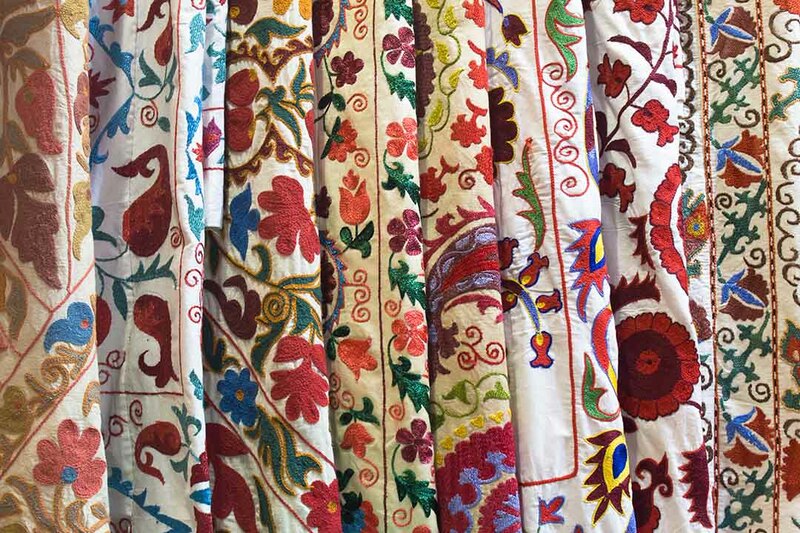 There’s some free time in the afternoon so feel free to explore more of Khiva or rest in the hotel! Breakfast included. 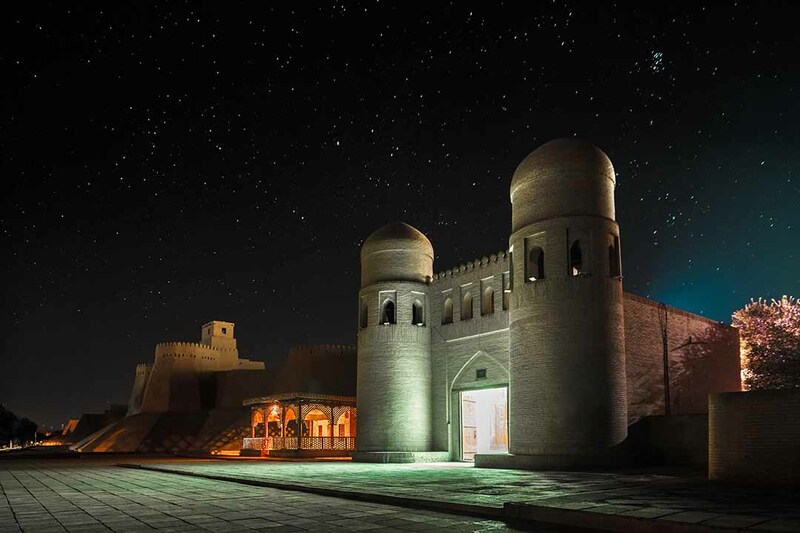 Overnight in Khiva. Today’s excursion is to Ayaz Kala fortress which dates back as early as the 4th century BC. The remains of this fortress are located on a hill which overlooks the surrounding plains, and they were originally designed to defend settlements from the raids of nomadic people. You’ll then be able to enjoy some local tea at a yurt camp in the shadow of the Sultan-Uiz-Dagh Mountains. We travel to Bukhara today through the Kyzylkum Desert, tredding in the steps of the traders that used to travel the Great Silk Road. On our journey we will stop to enjoy views of the Amudarya river and the desert. When we arrive at the hotel, we’ll have time to rest before our sightseeing tomorrow. Breakfast included. Overnight in Bukhara. 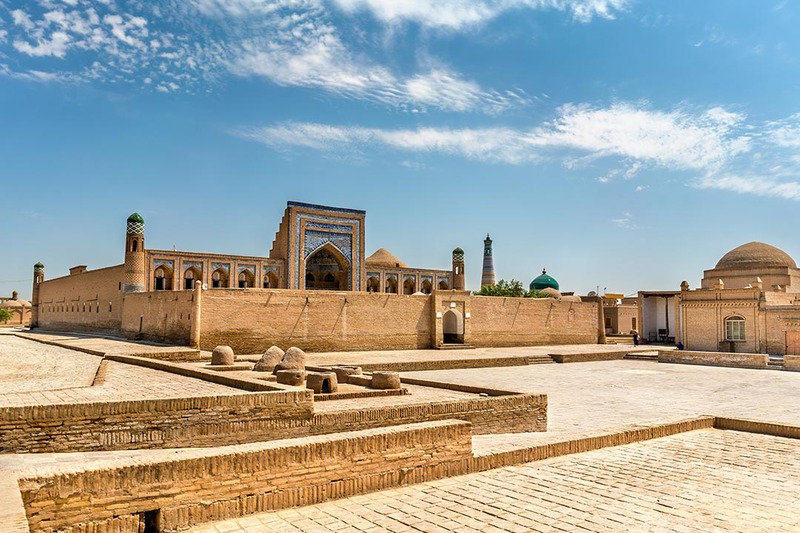 This morning, we’ll take a guided tour around the Old City of Bukhara which takes us past stunning mosques, madrasahs and mausoleums. In the evening, we’ll enjoy a folk show complete with national music, dance, food and costume. Breakfast and dinner included. Overnight in Bukhara. 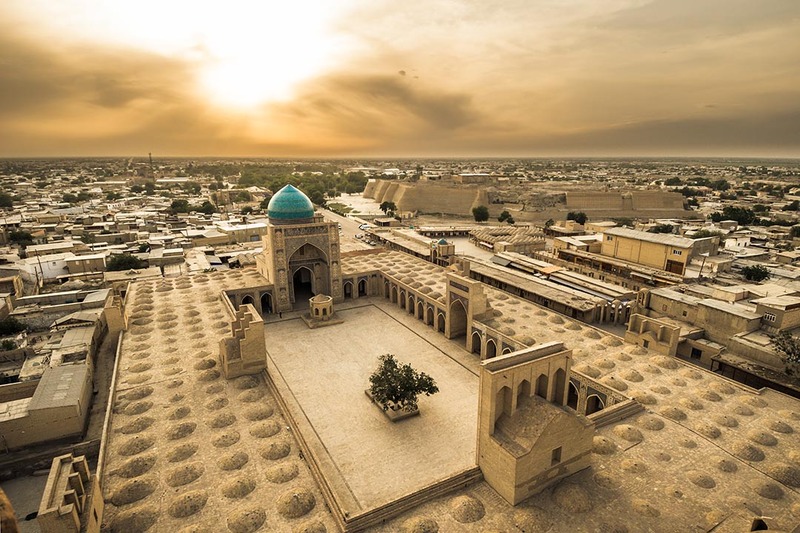 Today we’ll continue the sightseeing of Bukhara by exploring the Sitorai Mokhikhosa Summer Palace, Chor-Bakr Necropolis and Bakhouddin Naqshbandi Mausoleum. 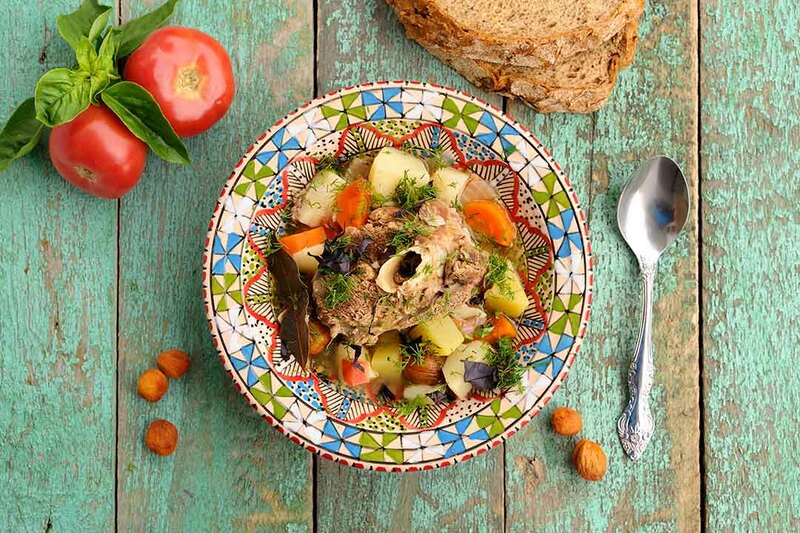 In the evening we’ll enjoy a Plov making masterclass, a rice-based dish with meat and vegetables. This local delicacy will be made with your very own hands before enjoying dinner with the group. On our visit to Gijduvan Village, we’ll visit a home of a famous pottery master and you’ll have the chance to learn about Gijduvan pottery. You’ll even get to make your own pottery using traditional methods. We’ll then embark on an exciting train journey through the countryside to Samarkand. Breakfast included. Overnight in Samarkand. Today we visit the awe-inspiring and immense Registan Square in Samarkand, one of the oldest cities in central Asia. We’ll also visit the remains of Bibi Khanum Mosque, Siyob, Bazaar, Ulugbek Observatory, Shakhi-Zinda Necropolis and the Gur Emir Mausoleum. This afternoon we’ll relax and unwind with a local wine tasting experience at the Khovrenko Wine Museum. This morning is more sightseeing of Samarkand with a visit to St Daniel’s Tomb where it is believed that the spirit of a buried saint patronises Samarkand and protects it. We’ll then venture to Koni Ghil Village to explore the traditional way of making Samarkand paper from mulberry before departing for Tashkent by train. We enjoy the morning at the sprawling Chor-Su Market to pick up some last minute local crafts before our international departure. The market is huge and is a bustling hive of activity with people from all over the city congregating here to buy meat, fish, fruit, nuts, breads and other local goods. This morning is also an opportunity to use Tashkent’s metro – the stations are fantastically ornate and definitely worth a visit. After midday, we’ll check out of the hotel before departing for our flight home. 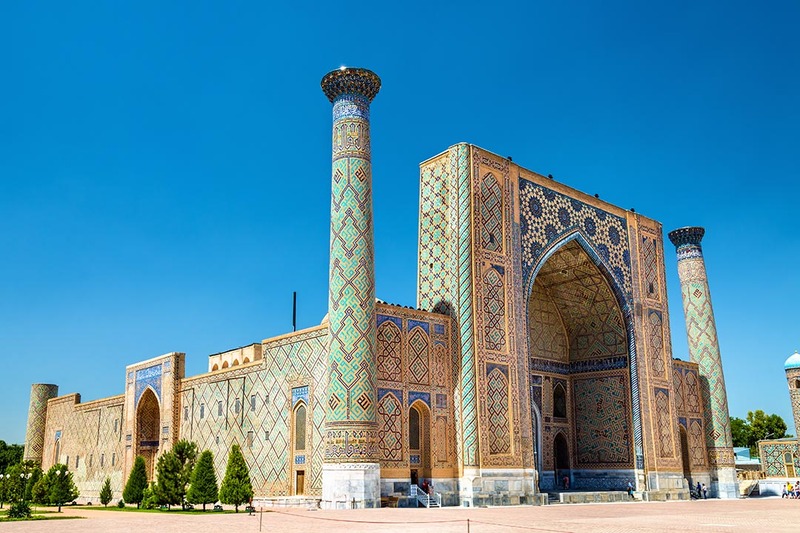 Visa Information: British passport holders can travel visa free to Uzbekistan for up to 30 days. This applies after 1st February 2019.